We’d love your help. 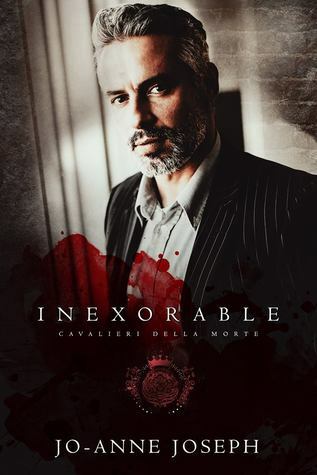 Let us know what’s wrong with this preview of Inexorable by Jo-Anne Joseph. Depends on which side of me they've faced. I'm cold, with an insatiable thirst for blood, lust, and money. You're either next on my list, or about to slip into my sheets. I'm Arthur Calthorpe, leader of the Tabella Della Morte. I don't trust, I own. I don't love, I desire. I don't ask, I take. But the monster has set his sights on me. He's ruthless, and he's found my achilleas heel. When he offers me a bargain, I'm hard-pressed to refuse. What lengths am I willing to go to be free of him, and how far will he go to stop me. To ask other readers questions about Inexorable, please sign up. Jo-Anne Joseph is an indie contemporary romance author, dreamer, doer, artist with a flair for creating stories about the seemingly impossible and second chance romance. Along with a passion for writing, she is an avid reader and enjoys painting and coloring. She also has a deep love for poetry and prose. Her lifelong love affair with words started at a young age and resulted in her debut novel In Jo-Anne Joseph is an indie contemporary romance author, dreamer, doer, artist with a flair for creating stories about the seemingly impossible and second chance romance. Along with a passion for writing, she is an avid reader and enjoys painting and coloring. She also has a deep love for poetry and prose. Her lifelong love affair with words started at a young age and resulted in her debut novel Infinity. Jo-Anne is a business professional by day and also writes on a volunteer basis for on-line publication Still Standing Magazine and the website Glow in the Woods. Her articles have been republished in several newsletters.